The staff of the Atlanta Minority Business Development Agency Business Center accepts its MBDA Century Club Awards. The Atlanta Minority Business Development Agency (MBDA) Business Center and the Atlanta MBDA Advanced Manufacturing Center — two programs at the Georgia Institute of Technology — were both given Century Club Awards at the MBDA’s National Training Conference held in Philadelphia, Pennsylvania, Aug. 20-23. The MBDA, a program of the U.S. Department of Commerce, is charged with promoting the growth of minority-owned business through public and private sector programs, policy, and research. More than 40 such centers exist across the country, including the two that are part of Georgia Tech’s economic development arm, the Enterprise Innovation Institute. The Century Club Awards recognize those MBDA centers across the country that exceed the federally program’s success metrics — scoring above 100 — in a number of areas including job creation or retention, access to financing and capital, and clients served. The Atlanta MBDA Business Center and Atlanta Advanced Manufacturing Center received scores of 120 and 106, respectively. In Fiscal Year 2018, the two centers reported more than $550.4 million in the value of new contracts, increased sales, bonding and financing to assisted firms, 893 jobs, and served more than 332 minority entrepreneurs served. “Our goal is to expand business opportunities for our clients, connect them with capital to sustain and fuel their growth and help them increase their bottom-line profitability,” said Donna Ennis, who serves as director of both centers at Tech. More than 250 minority business enterprise (MBE) manufacturers from across the country will be in Atlanta August 15 and 16 for the second annual National MBE Manufacturers Summit 2017. The Summit, which is hosted by the Atlanta Minority Business Development Agency’s (MBDA) Advanced Manufacturing Center at the Georgia Institute of Technology’s Global Learning Center, brings together world-class leaders in manufacturing and is the premier event that brings industry peers together, facilitates networking and procurement opportunities, and highlights innovation. BMW Group, Enhanced Capital, FORCAM, Grady Health System, Ingersoll Rand, Novant Health, Siemens, and WestRock are Summit sponsors. One-on-one fast pitch meetings with corporations and original equipment manufacturers. Opening Keynote: Theresa Carrington, CEO and founder of The Blessing Basket Project®. Luncheon Keynote: WestRock CEO Steve Voorhees. The Atlanta MBDA Advanced Manufacturing Center is a program of the Enterprise Innovation Institute (EI2), Georgia Tech’s chief economic development and business outreach arm. A sister program to the Atlanta MBDA Business Center, the Atlanta MBDA Advanced Manufacturing Center was created via a grant from the U.S. Department of Commerce MBDA awarded to Georgia Tech in 2016. One of four such centers across the country, Tech will receive $1.25 million over a five-year period to operate the Center, which is charged with providing targeted assistance to MBE manufacturers. The funding is designed to help identify, screen, promote, and refer MBEs to specialized advanced manufacturing programs, and provide technical and business development services and assist with access to capital, opportunities and markets. According to data from the U.S. Census Bureau’s 2012 Survey of Business Owners, the number of minority-owned manufacturers increased 30 percent between 2007 and 2012 to nearly 107,000. These firms generated $80 billion in annual revenue in 2012. More than 25,000 minority manufacturers employ almost 332,000 workers. The Summit is an outgrowth of the Atlanta MBDA Business Center’s Connecting Advanced Manufacturing Program (CAMP), which is now the Atlanta MBDA Advanced Manufacturing Center, Ennis said. “The vision behind CAMP and what led to us creating the Summit is to connect MBE manufacturers in the ecosystem to business opportunities, research, innovation, funding, and critical information they need to grow and thrive as businesses,” she said. To register for the Summit and for more information, please visit mbemanufacturersummit.com. Focused on building a national ecosystem of minority business enterprise (MBE) manufacturers, partners, and stakeholders, the Atlanta MBDA Advanced Manufacturing Center creates expansion opportunities for MBE manufacturers by facilitating their growth through innovation and technology, training and education, as well as advocating inclusiveness with corporate suppliers. As part of a national network of 42 centers, the Atlanta MBDA Business Center helps minority business enterprises access capital, increase profitability, create jobs, and become sustainable. 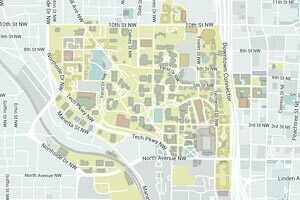 It is part of Georgia Tech’s Enterprise Innovation Institute (EI2), the nation’s largest and most comprehensive university-based program of business and industry assistance, technology commercialization, and economic development. 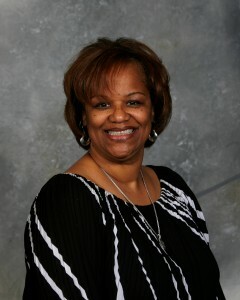 For more information, please visit mbdabusinesscenter-atlanta.org. Georgia Tech President G.P. 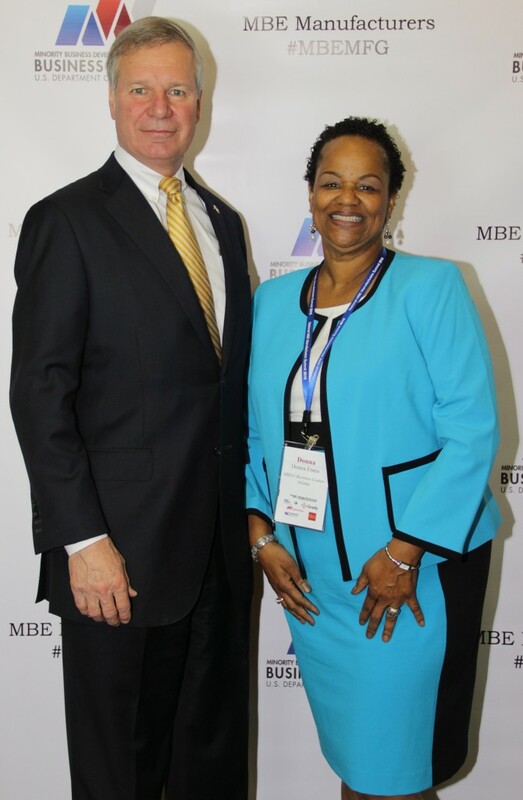 “Bud” Peterson, left, and Donna Ennis, director of the Minority Business Development Agency Business Center-Atlanta. The U.S. Department of Commerce Minority Business Development Agency (MBDA) named Georgia Tech Research Corp. as a grant recipient to continue to operate an MBDA Business Center in Atlanta. The federal funding will be distributed during a five-year period that ends in 2021. The funding amount per year is $298,255 for a total of $1.49 million. The grant program is designed to help minority-owned firms across the nation create jobs, develop their business, and compete in the global economy. A key component of MBDA’s Business Center Network is providing minority firms with access to technical expertise and resources to grow their businesses. 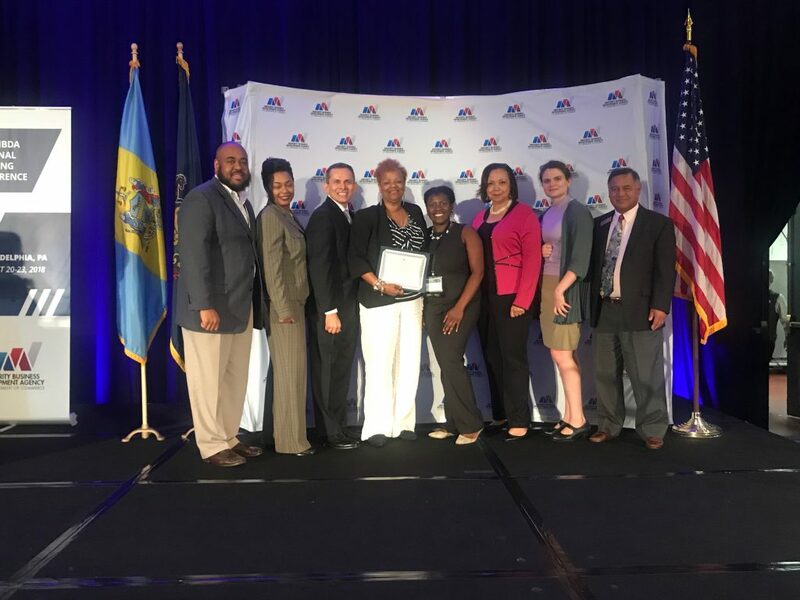 Ennis leads the MBDA Advanced Manufacturing Working Group, which is building a nationwide community of Minority Business Enterprise (MBE) manufacturers through its national network of 44 MBDA Business Centers. As part of that initiative, she launched the Connecting Advanced Manufacturing Program (CAMP) focused on providing contracting opportunities; assistance with launching new technologies, and building a nationwide ecosystem of MBE manufacturers. That led to the National MBE Manufacturers Summit 2016 at Georgia Tech this past March 24. According to the U.S. Census Bureau’s 2012 Survey of Business Owners, minority-owned firms in the United States increased to 8 million in 2012 from 5.8 million in 2007. Those 8 million businesses employed 7.2 million Americans. In Georgia, there are 371,588 minority-owned firms that contribute more than $38.4 billion annually in economic output. These firms employ more than 202,000 Georgians. Since 2009, MBDA Business Centers have assisted minority firms with gaining access to more than $31 billion in capital and contracts, while creating and retaining nearly 142,000 jobs. Established in 2004 and part of the Georgia Institute of Technology, the MBDA Business Center-Atlanta is a member of the national network of the U.S. Department of Commerce Minority Business Development Agency. The MBDA Business Center-Atlanta provides business and technical assistance to help emerging and existing minority business enterprises achieve significant growth and sustainability and create long-term economic impact through increased jobs and revenue. Donna Ennis, project director of the MBDA Business Center, Atlanta, Georgia (MBC), was named one of Atlanta’s Top 100 Black Women of Influence. Donna Ennis, project director of the MBDA Business Center, Atlanta, Georgia (MBC), has been named one of Atlanta’s Top 100 Black Women of Influence by the Atlanta Business League. Funded by the U.S. Department of Commerce’s Minority Business Development Agency and operated by Georgia Tech’s Enterprise Innovation Institute, MBC helps emerging and existing minority businesses experience significant growth and sustainability and generate long-term economic impact through the creation of jobs and revenue. Since 1994, the Atlanta Business League has published its annual list of “Atlanta’s Top 100 Black Women of Influence.” The list include black women in the metro Atlanta community who have reached senior level positions within their professions, are leading entrepreneurs in their industries or have attained the ability to influence large public bodies politically. In addition to professional accomplishments, the “100 Black Women of Influence” have demonstrated their commitment to the citizenry of Metro Atlanta by maintaining significant involvement and participation in community and civic activities. Ennis is responsible for the strategic direction, marketing and outreach, and operations of the GMBEC and assists clients with strategic, business and market planning; marketing research and communications; public and private procurement, finance and operations; and business process improvement. She has more than 25 years of experience in marketing, communications, public relations and business development, with emphasis on identifying company needs and matching them to the appropriate resources. Ennis is also a member of the board of directors of the Georgia Resource Capital and the National Center for the Prevention of Home Improvement Fraud and on the board of trustees of Atlanta Unity Church. She has a bachelor’s degree in communications from Boston University and a master’s degree in public administration from Georgia State University. For more information on GMBEC services offered by Georgia Tech’s Enterprise Innovation Institute, contact Donna Ennis (404-894-2096); E-mail: (ude.hcetag.etavonninull@sinne.annod); Web site: (www.georgiambc.org). Media Relations Contact: John Toon (404-894-6986); E-mail (ude.hcetag.etavonninull@noot.nhoj).